You can’t do Christmas without some sort of glitter right? If you’re not into donning top to toe sparkles, maybe you should try my favourite combo for a lil’ bit of shine without going overboard. Plus, if it’s just on the tips of your nails, you won’t cry trying to remove it as there’s nothing worse than a full nail of glitter. The pain! Anyway, here’s the prettiest more low-key festive nail for this season. First, take your favourite polish – I find Essie After School Boy Blazer the perfect dark background hue, but shades such as soft pinks, whites or greys also work well – and paint your nails as usual. Make sure it’s really dry before applying the next coat. 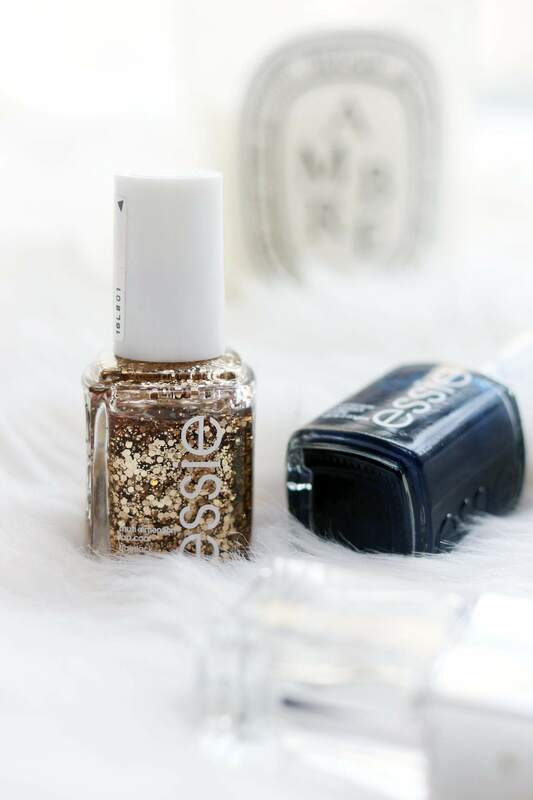 Take your glitter shade – I used Essie Summit of Style, which is the most luxurious deep bronze-gold – and start applying it to the first half of your nail. Apply more at the top and then lightly brush it down to depart some of the glitter. Once this is slightly dry, apply more gold right at the top to increase the gradient style. Once this has dried, apply a top coat to seal it all and you’re done. Sparkly nails with minimal effort!